This page of the 1722 notebook contains the gavotte from French Suite No. 5 (BWV 816). The title Notebook for Anna Magdalena Bach (German: Notenbüchlein für Anna Magdalena Bach) refers to either of two manuscript notebooks that the German Baroque composer Johann Sebastian Bach presented to his second wife, Anna Magdalena. Keyboard music (minuets, rondeaux, polonaises, chorales, sonatas, preludes, musettes, marches, gavottes) makes up most of both notebooks, and a few pieces for voice (songs, and arias) are included. The Notebooks provide a glimpse into the domestic music of the 18th century and the musical tastes of the Bach family. The two notebooks are known by their title page dates of 1722 and 1725. The title "Anna Magdalena notebook" is commonly used to refer to the latter. The primary difference between the two collections is that the 1722 notebook contains works only by Johann Sebastian Bach (including most of the French Suites), while the 1725 notebook is a compilation of music by both Bach and other composers of the era. Title page of the first (1722) Notebook for Anna Magdalena Bach. Note the titles of the three Pfeiffer books written by Bach in the lower right corner. Ante Calvinismus is a shortened and misspelled title of Anti-Calvinismus, oder Unterredungen von der Reformierten Religion (Anti-Calvinism, or Conversations about the reformed religion). "Christen Schule item" refers to Pfeiffer's Evangelische Christen Schule ("Evangelical Christian School"). AntiMelancholicus refers to Anti-melancholicus, oder Melancholey-Vertreiber (Anti-melancholy, or [something or someone] to drive out the melancholy]). Five keyboard suites. The first three are fragments of the pieces that are now known as the first three French Suites, BWV 812–814. The next two are complete suites, French Suites Nos. 4 and 5, BWV 815–816. The minuets of suites 2 and 3 are separated from the rest of their respective suites and were most probably added at a later date by Anna Magdalena Bach (they are almost certainly in her hand), some time before 1725. Fantasia pro organo, unfinished, BWV 573. A short organ piece, 12 complete bars and the beginning notes of the 13th bar. Air with variations in C minor, unfinished, BWV 991. The first 10 bars feature coherent two-part writing, but the remaining 35 bars only have one voice written out. "Jesus, meine Zuversicht", chorale prelude, BWV 728. A brief (9 bars) piece in three voices, features two sections with repeats for each. Minuet in G major, BWV 841 (not to be confused with Petzold's Minuet in G Major in the 1725 notebook). A short dance with simplistic two-part writing and two sections with repeats for each. Keyboard partita in A minor, BWV 827. This is the third partita from Bach's set of Partitas for keyboard BWV 825–830, which was published in 1731 as the first volume of Clavier-Übung. Keyboard partita in E minor, BWV 830. This is the sixth partita from Bach's set of Partitas for keyboard BWV 825–830. Minuet in F major, BWV Anh. 113. Minuet in G major, BWV Anh. 114. Usually attributed to Christian Petzold. Minuet in G minor, BWV Anh. 115. Usually attributed to Christian Petzold. Rondeau in B-flat major, BWV Anh. 183. This piece is by François Couperin and is best known under the original title: Les Bergeries (6e Ordre). March in D major, BWV Anh. 122. Usually attributed to Carl Philipp Emanuel Bach. Polonaise in G minor, BWV Anh. 123. Usually attributed to Carl Philipp Emanuel Bach. March in G major, BWV Anh. 124. Usually attributed to Carl Philipp Emanuel Bach. Polonaise in G minor, BWV Anh. 125. Usually attributed to Carl Philipp Emanuel Bach. Menuet fait par Mons. Böhm, by Georg Böhm. Not included in the BWV catalogue. Aria "Bist du bei mir", BWV 508. This composition is probably the most well-known of the arias of the 1725 notebook. Its melody is by Gottfried Heinrich Stölzel. Keyboard aria in G major, BWV 988/1. Another well-known piece, this is the aria of the Goldberg Variations, BWV 988. Christoph Wolff has suggested that this Aria was entered into the two blank pages of this book by Anna Magdalena later, in 1740. Solo per il cembalo in E-flat major, BWV Anh. 129. A harpsichord piece by Carl Philipp Emanuel Bach. Polonaise in G major, BWV Anh. 130. Possibly composed by Johann Adolph Hasse. Prelude in C major, BWV 846/1. This is the first prelude from The Well-Tempered Clavier, Book 1, with bars 16–20 omitted, most likely in order to make the piece fit in two pages. Keyboard suite in D minor, BWV 812. This is the first French Suite. Keyboard suite in C minor, BWV 813. This is an incomplete version of the second French Suite. Movement in F major, BWV Anh. 131. The handwriting looks like that of a child, and apparently the piece is an attempt to create a bass line for a given melody. The Notebooks contain instrumental as well as vocal music. The recitative "Ich habe genug" and the aria "Schlummert ein, ihr matten Augen", the second and third movements of the second version of Cantata Ich habe genug, BWV 82, appear in the 1725 Notebook. The four-part chorale "Dir, dir, Jehova, will ich singen", BWV 299, also appears in a two-part setting in Schemellis Musicalisches Gesang-Buch (BWV 452). The second Notebook contains a number of songs and arias set for voice and continuo. "Bist du bei mir", BWV 508, is an arrangement of an aria of the opera Diomedes by Gottfried Heinrich Stölzel. "Gedenke doch, mein Geist, zurücke", BWV 509 is an aria contained in the second notebook. The sacred songs BWV 510–512 are three settings of "Gib dich zufrieden und sei stille" for voice and continuo. BWV 397 is the four-part realisation of this song. "Schaffs mit mir, Gott", BWV 514, is a sacred song for voice and continuo. The aria "So oft ich meine Tobackspfeife" appears in two versions, BWV 515 and 515a, the second a fourth higher than the first. The aria "Warum betrübst du dich", BWV 516, is a setting for voice and continuo. "Wie wohl ist mir, o Freund der Seelen", BWV 517, is a sacred song for voice and continuo. The authenticity of "Willst du dein Herz mir schenken", BWV 518, also known as "Aria di G[i]ovannini", is doubted. The first Notebook contains two compositions for organ. The chorale prelude Wer nur den lieben Gott lässt walten is No. 11 in the second Notebook. The Fantasia in C major for organ, BWV 573, is a fragment contained in the 1722 Notebook. The chorale prelude "Wer nur den lieben Gott lässt walten", BWV 691, also appears in the Kirnberger Collection. The chorale setting Jesus, meine Zuversicht, BWV 728, is ranged among Bach's chorale preludes for organ. The keyboard pieces are the largest group of compositions in both Notebooks. The first Notebook contains early versions of the first five French Suites, BWV 812–816. the first and the second French Suite also appear in the second Notebook. The second Notebook starts with the third Partita, BWV 827, from Clavier-Übung I, followed by the sixth Partita, BWV 830, from that opus. 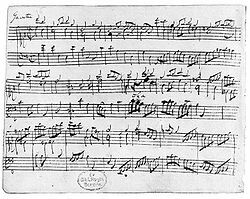 The Minuet in G major, BWV 841, is also contained in the Klavierbüchlein für Wilhelm Friedemann Bach. The prelude of Prelude and Fugue in C major, BWV 846, from The Well-Tempered Clavier appears in a short version in the second Notebook. The Air with variations in C minor, BWV 991, is a fragment contained in the first Notebook. The Minuet in F major, BWV Anh. 113, is No. 3 in the second Notebook. Its attribution to J. S. Bach is considered doubtful, and for that reason it is included in Anhang (Anh.) II of the Bach-Werke-Verzeichnis. The two Minuets in G major and G minor, Nos. 4–5 in the second Notebook, BWV Anh. 114 and 115, were composed by Christian Petzold. Because their former attribution to Bach is spurious they appear in Anh. III of the Bach-Werke-Verzeichnis. Anh. III 129 – No. 27: Solo per il cembalo in E-flat major by C. P. E. Bach (early version of the keyboard sonata Wq 65.7 / H 16). Anh. III 130 – No. 28: Polonaise in G major by Johann Adolph Hasse, i.e. "Polonoise secondo", originally in F major, from his keyboard sonata in F major. No. 21 of the second Notebook, "Menuet fait par Mons. Böhm" (Minuet by Mr. Böhm), in G major, was never assigned a number in the BWV catalogue. It is however included in both the Bach-Gesellschaft Ausgabe (BGA) and the New Bach Edition (Neue Bach-Ausgabe, NBA) of the Notebooks. There is some doubt which composer by the name Böhm may have been intended, Georg Böhm being the best known among them. Anna Magdalena, a 1998 Hong Kong film titled after the Notebook; Minuet in G is featured extensively throughout the movie. ^ Williams, Peter F.. 2007. J.S. Bach: A Life in Music, p. 158. Cambridge University Press. ^ Schulenberg, David. 2006. The Keyboard Music of J.S. Bach, p. 522 and elsewhere. ^ Andreas Glöckner in: ''Bach-Jahrbuch 2002, pp. 172–174. ^ Diomedes (Excerpts): "Bist du bei mir geh ich mit Freuden"
Wikimedia Commons has media related to Notebook for Anna Magdalena Bach.